An American Housewife: What is Nalysnyky? Today America features some of best foods from around the world thanks to our diverse nationalities. I'm thankful as ever for the internet and for sites like Wikipedia where I got this photo for Nalysnyky - pronounced (na-lish-na-key) - or if you prefer; 'Ukrainian Crepes'. Basically, Nalysnyky is.... a thin pancake. I found fillings calling for cottage cheese dill and others taking more of a sweet approach with raspberries or strawberries and cream. Being more of a savory type person than sweet, this recipe found itself in my files years ago by luring me in with one of my favorite foods; cheese! 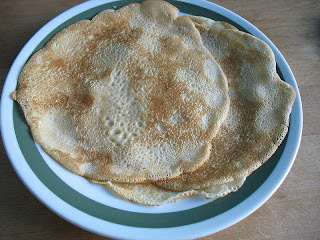 The Nalysnyky recipe can be doubled or tripled as it will only make about 8-10 crepes. Beat the eggs with a beater until light, add milk and water, beat again. Gradually add the flour and salt, continuing to beat as you add the flour. Beat until smooth. The batter will be thin. Pour a few tbsps of batter into the center of a heated and greased small frying pan. Tilt the pan to distribute the batter evenly across the bottom. Cook over moderate heat. When lightly browned on the bottom and firm to the touch on top remove cake to a plate. Continue frying in this manner until the batter is used up. Combine cottage cheese, egg yolks, 2tbsps of cream, salt and dill until smooth in texture. Add 1 or 2 more tablespoons of cream if mixture appears to thick. Spread filling down the center of each Nalysnyky and roll each into a tube. Lay the Nalysnyky side by side in a buttered casserole dish .Spread 1 tablespoon of butter over each layer. You may have up to 2 layers. Pour the 2-3 cup of cream over the Nalysnyky and cover with foil. Bake at 325*F for 30 minutes. Remove the foil for the last 5 minutes of baking. "... I wanted to recommend ground chicken for the inside. We usually just buy a rotisserie chicken that's already cooked to save time. Pick the meat off, run it through a food processor or meat grinder and with some salt, pepper, garlic, caramelized onions, whatever you like. Simply stuff and roll. They make an excellent dinner with some sour cream or cheese sprinkled on top and a side salad." Thanks Kelly!!!! I love hearing from my readers!